Being evicted used to be rare decades ago. But today, millions of Americans are forced out of their homes each year for not paying the rent. This, according to Matthew Desmond, a sociology professor with the Justice and Poverty Project at Harvard. Desmond lived in a trailer park and a rooming house in Milwaukee, Wisconsin, to document what happens to people after they are evicted. He witnessed families forever changed as they were forced into shelters, lost jobs and taken out of school. Guest host Tom Gjelten talks with Desmond about how the lives of eight families were transformed by eviction and what they tell us about the relationship between poverty and housing in America. Vanetta (a pseudonym) A mother of five children living in Milwaukee, Wisconsin. Her family's story of being evicted is depicted in Matthew Desmond's book "Evicted." Tim Ballering Founder and owner of Affordable Rental Associates, LLC, a company in Milwaukee, Wisconsin that rents and manages inexpensive residential properties. MR. TOM GJELTENThanks for joining us. I'm Tom Gjelten sitting in for Diane Rehm. Social scientists and policymakers generally focus on jobs, public assistance and mass incarceration as the big problems facing America's low income families, but Matthew Desmond, a Harvard sociologist, says the lack of access to affordable housing has become a major cause of poverty, one that's often overlooked. His new book is "Evicted: Poverty and Profit in the American City." Desmond joins me here in the studio. MR. TOM GJELTENAlso with us, Rolf Pendall, director of the Metropolitan Housing and Communities Policy Center at the Urban Institute. We have some dramatic stories to relate and I'm sure you'll want to weigh in with your own thoughts and questions. We'll be taking your calls. Our number is, 1-800-433-8850. We'll be reading your emails. Send them to drshow@wamu.org. You can also reach us via Twitter or on our Facebook page. MR. TOM GJELTENMatt and Rolf, thanks for being here. MR. MATTHEW DESMONDThanks for having us. GJELTENMatt, let me say, first off, that this is an exceptional book. GJELTENYou know, we journalists think of ourselves as good storytellers and sometimes regard the work of academics as a little bit dry and sometimes wonky, but "Evicted" is a gripping a non-fiction narrative as I've read in a long time and I'm thinking it's because you lived with the people that you write about for such a long time, more than a year, right? GJELTENAnd that's like what anthropologists do, ethnography. In fact, I think you describe yourself, in your work, as ethnography. But sociologists don't do that so often. How is it that you -- why is it that you decided to take this ethnographic approach to what you're writing about? DESMONDYou know, poverty had always bothered me. You know, America stands alone in comparison to all wealthy democracy for the depth and expanse of its poverty and I really wanted to understand that and understand the role that housing, particularly, plays in deepening inequality in this country. And so I thought the best way to do that was the old fashioned way, is by embedding myself in the lives of families that are getting evicted, but also their landlords doing the evicting. And so I lived in a trailer park on the far south side of Milwaukee, rented a trailer there for several months. DESMONDAnd then, I moved into a rooming house on the north side, which is a traditional inner city area of that city and lived there for about ten months. And from those two areas, kind of went everywhere with these families and with these landlords and tried to really understand what poverty looks like on a day to day basis. GJELTENNow, you say you were interested in the role that housing plays in poverty. To me, that's like the most important -- that's really the groundbreaking aspect of your book is that you are able to highlight that in a way it's never been before. Was that your thought going in or did you go in -- did you sort of discover, in the course of your work, how important housing was in explaining poverty? DESMONDI discovered a lot. I discovered a lot. I had no idea how frequent evictions were, you know. Evictions, I thought, might be a lot more rare. In the city of Milwaukee, there's about 40 people every day, in the summer and the winter, evicted from their homes. You know, that was astonishing to me. And I think that most Americans, if they don't live in trailer parks or in the inner city, think that the typical low income family lives in public housing or benefits from some kind of housing assistance, but the opposite is true. DESMONDOnly about one in four families, who qualify for housing assistance, receive anything so the vast majority of low income Americans are living unassisted in the private rental market, giving almost everything they have to pay for housing. GJELTENAlmost everything they have. Be a little bit more specific about the people that you lived with, how much of their income was going to housing. DESMONDSure. I think of people like Arlene, who is a single mom of two boys, who was living in a run down two bedroom apartment in a very poor neighborhood in Americas fourth poorest city giving 80 percent of her income to rent. I think of Lorraine, who is a grandmother, in the trailer park that I lived in, she received disability for a childhood fall she took. She was paying over 70 percent of her income to rent. And, you know, these stories aren't unique. DESMONDYou know, we've reached a point in this country where the majority of poor renting families are giving at least half of their income to housing cost and one in four are giving over 70 percent of their income just to pay rent and keep the utilities on. GJELTENAnd you're talking about half or 70 percent of what are low incomes to begin with so there's very little left over. DESMONDThat's exactly right. You know, someone like Arlene had just a little over $2 a day to make ends meet after her rent was paid. GJELTENYou can't make ends meet on $2 a day. DESMONDShe didn't. You know, she didn't. And I saw Arlene confront terrible situations. Should I pay my rent or feed my kids? Should I pay my rent or get the kids clothing they need for a new school year? Should I chip in for a funeral for when my sister dies? You know, these are the very difficult choices that low income parents are facing out there because the rent takes so much of their income. GJELTENSo in the time that you were following Arlene around, for example, how many times was she evicted? DESMONDI lost count. I lost count and I think she did, too. And so she was evicted from the unit that she was paying 88 percent of her income to rent in. She did help pay for a funeral when her sister died. Not her sister in the biological sense, but in the spiritual sense, a very close friend. And then, she missed an appointment with a welfare caseworker because the letter announcing the appointment was mailed to a previous address from which she was evicted and she got the pink papers and was evicted there. DESMONDAnd I think the take-home for me is that, you know, when you're paying so much of your income for housing, it doesn't take a major event to invite and eviction, something as innocent as a snowball hitting a car and causing a man to kick your door in. That was the cause of one of Arlene's eviction. GJELTENThat's the story you open your book with. Her son threw a snowball at somebody, hit them, they came running and then kicked down the door and the damage to the door then angered the landlord enough that he kicked her out. DESMONDThat's right. 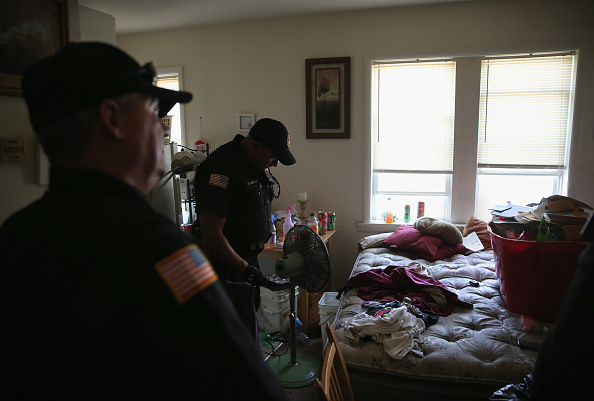 You know, under these conditions, eviction is not always the result of irresponsibility. It's often the result of inevitability. You know, people just can't make ends meet when they're dedicating so much of their already low incomes to housing. GJELTENAnd tell us what happens when people are evicted in terms of what does it -- well, you already mentioned, you know, the issue of -- you lose your address, which can be really important, but what is the sort of the cycle that kicks in with eviction? DESMONDWhen I started this book, I thought eviction would allow me to tell a different story about poverty America. I'm not convinced that eviction is a cause, not just a condition of poverty. It makes things worse so people lose not only their homes, but often their possessions, which are either piled on the sidewalk or taken by movers and you have to keep up payments and a lot of folks just can't. You know, the biggest moving company in Milwaukee told me that about 70 percent of their moves that they do that are evictions or foreclosures just get thrown in the dump. DESMONDYou know, people lose their communities. Children lose their schools. We have good evidence that workers often lose their jobs. And anyone listening out there who's been through an eviction or through a foreclosure can tell you why, it's such a consuming, overwhelming, stressful event that can cause you to make mistakes at work and eventually lose that job. And then, there's the role that eviction plays in your mental health, your depression. And we know, for example, that suicides attributed to foreclosures and evictions doubled between 2005 and 2010. DESMONDAnd we have evidence that mothers who are evicted experience higher rates of depression two years later. So you add that all up, right, and you're left with a really strong picture of how eviction is driving people deeper into poverty and making their lives much harder. GJELTENNow, you said at the beginning, I think you said one out of eight renters in Milwaukee have been evicted during the time that you looked at, right? DESMONDThat's right. And so we worked really hard to capture not only formal evictions that go through the court, but informal evictions that don't. You know, I met a landlord that pays you to leave if you're out by the end of the month. I met a landlord that takes your door off. We tried to capture all those kinds of informal evictions as well as building foreclosure, building condemnations and landlord foreclosures. When you add all that up, it's about one in eight renters in the city of Milwaukee are evicted every two years. That's an astonishing number. GJELTENYeah. Rolf Pendall, what -- that's -- he's talking about Milwaukee. What's your sense sort of more on a macro basis across the country? Does that one out of eight figure hold or is it -- I'm sure it varies from locale to locale. MR. ROLF PENDALLI'm sure it does vary from locale to locale, but one of the challenges is trying to capture a process that looks like an eviction to a social science researcher in the national data that we have. So we have a national survey that asks people open-ended questions about why they moved the last time they moved. And if the word eviction pops up there, then it's tracked. But maybe Matt can talk a little bit about what a small fraction of the people that he was interacting with would really use the world eviction to describe the process. GJELTENOh, it's got a lot -- it's a loaded term, isn't it? GJELTENIt's up in your court record. PENDALLYeah, and it's also a term of personal shame and failure in some cases. But what we do know from those national surveys is that the recession, about 2009, 2010, we did have a peak in evictions. Since the economy's gotten better and since the worst of the disruption of the crisis has sort of passed and we're in a new phase now, evictions are down somewhat by these national statistics. GJELTENAnd Matt, you were there in Milwaukee at just about the bottom, the worse period, I guess, huh? DESMONDYes, but, you know, evictions were high before the crash and they're pretty darn high after the crash, too. You know, I remember my neighbors in the trailer park, Tim and Rose, and they were evicted. Their names appeared in the eviction court, but if you asked them, like we do on our national surveys, were you evicted, they would've said no because they think eviction is a sheriff coming knocking on your door, taking your stuff, putting it on the curb. That's an eviction. DESMONDAnd so we need to have better ways of asking these questions and that's why when we look at court records, they're much higher than self administered surveys. GJELTENMatthew Desmond is the author of the book, "Evicted: Poverty and Profit in the American City." He is a professor of sociology and co-director of the Justice and Poverty Project at Harvard University. He's also the recipient of a 2015 McArthur Genius Grant. We're also joined here in the studio by Rolf Pendall who's director of the Metropolitan Housing And Communities Policy Center at the Urban Institute. GJELTENWe're talking about Matt's new book, "Evicted: Poverty and Profit in the American City." It's a fascinating book. There's a lot to go over, dramatic stories from the people whose lives he followed. We're gonna take a short break now. Please stay with us. GJELTENHello again, I'm Tom Gjelten from NPR. I'm sitting in for Diane Rehm today, and we're talking about eviction and the role that it plays in aggravating or causing poverty in American cities. And my principal guest is Matthew Desmond, who has a terrific new book out, "Evicted: Poverty and Profit in American Cities," a sociologist at Harvard University. Also with us is Rolf Pendall, who's director of the Metropolitan Housing and Communities Policy Center at The Urban Institute. GJELTENJust before the break we were talking about how eviction often sets in motion a sort of a cycle, which makes everything worse for the people who go through it. We actually have an email here from Paul, who says, in my state, simply having a criminal record will exclude you from getting affordable housing or public housing no matter what the crime was. How are these people supposed to get back on their feet when they cannot even get a roof over their head? GJELTENWell Paul, you should read Matt Desmond's book because it will totally reinforce your concerns. And Matt, I'm wondering if you can read -- your stories are so dramatic, and I think the best way to get to them is actually have you read one of the stories. I think you're going to read us about a woman you're calling Vanetta. DESMONDSure, so this passage has mention of something called The Lodge, which is a Salvation Army homeless shelter in Milwaukee. A lot of the folks that I spent time with just called it The Lodge, so you can tell your kids we're staying at The Lodge tonight like it's a hotel. And it also mentions a woman named Crystal, who is someone that met Vanetta at the homeless shelter while they were both looking for a place to live. DESMOND"Vanetta Evans had been staying at The Lodge since January. At 20, she was not much older than Crystal, but she had grown up fast. Vanetta had her first child, Kendal Jr., when she was 16, then a daughter, Tembi, the next year, and a third a year after that, a boy named Bo-bo. You might say that Vanetta was raised in the Robert Taylor homes, in Chicago's infamous public housing towers, or you might say that her mentally challenged mother, whom Vanetta and her siblings unaffectionately called Shortcake, raised her in almost every homeless shelter in Illinois and Wisconsin. DESMONDCrystal liked the way Vanetta carried herself. She was always put together, with her hair pulled back in a tight -- in a small ponytail. She even worse her cell phone on her belt holder, like a landlord. Vanetta's dark brown skin matched Crystal's, and she had a smoky lounge-singer voice that she almost never raised at her kids. She could snap them in like by giving them the look. When Kindle Jr. acted out, Vanetta pretended to call Big Kindle, his father, on the phone. The boy knew she was faking but would calm down anyway. When Bo-bo had seizures, she rushed him to the hospital. DESMONDThe two women began swapping cigarettes, each keeping mental note of the number of Newports given and received. Soon they upped the ante, taking incremental but expedited steps towards establishing a relationship of reciprocity. They exchanged snacks, then small bills, then meals purchased at fast food restaurants. Through passing references, they began learning about each other's resources, Vanetta received $673 a month from welfare and $380 a month in food stamps, as well as their character and their temperament. DESMONDCrystal and Vanetta began calling each other sister. After a week they decided to look for housing together. Roommates inside the homeless shelter would become roommates outside of it. Crystal didn't think she needed to worry about Vanetta's upcoming sentencing hearing. Prayer is a powerful thing, she said. Vanetta thought her chances of avoiding prison were decent even without Jesus. It was a first offense. DESMONDThe trouble had started when Old Country Buffet slashed Vanetta's hours. Instead of working five days a week, she would now only work one. Her manager blamed the recession. After that, Vanetta couldn't pay her electricity bill. WI Energies threatened disconnection unless she paid $705. There was no way she could pay that and the rent, but she worried that Child Protective Services would take her kids away if her lights and gas were shut off. DESMONDThe thought of losing her children made Vanetta sick to her stomach. Then she fell behind in rent and received an eviction notice. She felt helpless and terrified. Her friend, who had also received a pink paper, felt the same way. One day, with Vanetta's boyfriend, the two women sat in a van and watched another pair of women walk into a Blockbuster, carrying purses. Someone suggested robbing the women and splitting the money. Then all of a sudden that's what they were doing. Vanetta's boyfriend unloaded his gun and handed it to her friend. The friend ran from the van and pointed the pistol at the woman. Vanetta followed, collecting their purses. The cops picked them up a few hours later. DESMONDIn her confession, Vanetta had said, I was desperate to pay my bills, and I was nervous and scared and did not want to see my kids in the dark or out on the street. When she turned 18, Vanetta had put her name on a list for public housing. Becoming a convicted felon meant that her chances of ever being approved were almost zero." GJELTENThat's a dramatic story, a really compelling one, and we actually have Vanetta on the phone from Milwaukee, Wisconsin. Vanetta, hello, thanks for being with us. VANETTAHi, thank you all for having me. GJELTENWell, thanks for sharing your stories with us. And I'm sure hearing Matt read that section brings back a lot of memories for you. You're -- fortunately your life has really improved a lot since then, but tell us a little bit more about that time, beginning with your experience at The Lodge. VANETTAWhen I was -- okay, I had the three kids, and I was staying in my own place. I was served with eviction papers to move around December of '08. At that point in time, I began looking for shelters and trying to find other places to live, but I barely had, like, resources to rely on or anything. So I continued to call shelters, I kept getting denied, kept getting denied. They put my name on the waiting list at the shelter, and finally they accepted us. VANETTAI told the kids one day that we was going to stay at a hotel, like Matt mentioned, where you can tell them it's a hotel so they wouldn't have to, like, ask so many questions or be worried. They really didn't understand what the shelter was at that point in time, anyway. So we went there, we stayed the for a while. During that time, we looked for housing and tried to -- I tried to find a place to stay with my kids. It was so hard at that time. GJELTENSo Vanetta, how many times did you -- you know, estimating, how many times did you look for an apartment? How many times did you apply to rent a property? VANETTAOh my God, it was probably like 100 times. I kept getting denied, kept getting denied, and then at that point in time I had a fresh crime, so it was like double jeopardy, not only do I have this eviction on my name, but I have, like, a conviction as well, like if somebody CCAP me, it was right there, they could see it. So nobody wanted to rent with somebody with evictions or that was facing -- had a criminal background. So I just kept getting denied, kept getting denied. VANETTASo finally the place that we did end up in, at that point in time, I got tired of looking at so many places and being on the street and staying with people and getting put out and worried about how we was going to make it through the day or where we was going to sleep at night or how I was going to feed the kids. So I just took the first, the first thing that somebody accepted to me and the kids, I just took it. I didn't care how it looked. I just felt like as long as we had a place over our head at that point in time, and we were safe off the streets. GJELTENAnd Vanetta, you mentioned at one point that you were concerned about that they would CCAP you. What do you mean by that? GJELTENThat's some kind of online recordkeeping. VANETTAYes, yes, and when they pull it up there, and they see the eviction popped up, which was fresh that year, and then now I got a criminal court charge that I'm facing so that was, like, a big turnoff for landlords. And then I was receiving W2 at the time, and they was worried, like how are we going to get our money. Most of them wanted, like, a payment up front, last month's payment plus security deposit. Mind you, I'm only getting $673 on W2, and it's just met at that point in time. So it was, like, it was hard. It was stressful. I felt depressed. And I didn't know what to do. GJELTENWell and you all the time had your children to worry about, and it sounds like one of your children is with you right now as we speak. VANETTAYes, yes, I have one of the little ones with me. GJELTENSo your story ends rather happily, and of course for many people who are caught up in this cycle of poverty and eviction, it doesn't end so well. How were you able, what did you have to do to finally take charge of your life, or how were you able to turn things around in your own life? I now understand you're now studying to be a dental hygienist. VANETTAI am. I just started school for that. But where I'm staying now, I've kind of been there for almost two years. My main thing was just to, like, build some rental history so when I do get ready to go out and search for a better housing, somewhere nice for the kids to be able to go outside and play without hearing gunshots or me being worried about them, I just decided to take whatever was handed to me. When I got out jail, like I said, it was even harder finding a place. VANETTASo when I did fine one, I just choose to stay there for a while and try to build up a little bit of rental history so when I do get ready to move into somewhere nice, I won't have that, like, following me, oh you move around too much, or you're not able to pay the rent or just anything that will hinder me from getting a nice place. GJELTENBut I'm a sure a lot of the people who you know, a lot of the people that you've lived with over the years or known over the years, have had a lot of difficulty getting out of the situation, the situations like the one you were in. VANETTAIt's hard. You just, you've got to -- I really don't know how some people get out of it. I know I got out of it by just trying to stay positive, try to take as many resources out here as far as bettering myself when it came to school. I got back in school, I got my GED. I kept a job for a while. I'm still at the job. Like, I just tried to change the way I was living and try to, like, think more positive, if you want to say, like. GJELTENWell congratulations to you, Vanetta. We're rooting for you, and we're really pleased that you have been able to think in a more positive term. Have you read part of Matt's book, like for example the part right now that he read for us, where he talks about you? Have you seen that before? VANETTAI did. I cried. Every time I read that part, I cry because it was, like, that was one of my hardest times in life right there. And as a kid, like Matt mentioned in the book, I grew up in every shelter, basically, in Illinois and Milwaukee. I didn't have a stable place over my head. I didn't have proper food, or I didn't even know a few times how I was going to eat that night. We missed meals multiple nights, and it was hard. And all I ever wanted for my kids was not to put them through that. I just wanted to give them something different, and at that point in time, when I was reading that book, I felt like a failure. I was like I did everything that I didn't want to do. VANETTAI just felt, like, so, like I failed at being a parent to my kids. GJELTENWell, you haven't been a failure. So we, as I say, we are proud of you for what you have accomplished, and I'm sure that your kids will be proud of you, as well. GJELTENThanks for joining us, Vanetta of Milwaukee, Wisconsin, and her family's experience is written about in Matthew Desmond's new book, "Evicted." Again, Vanetta, thanks for calling. I know it's hard. VANETTAThank you for having me. GJELTENSo Matt, seven more stories like Vanetta's in your book, seven more families that you profile. DESMONDThat's right, and I think that, you know, the book profiles the hard stuff, but it also profiles these moments of generosity and these moments of humor, you know. It tells you that Vanetta organized an Easter egg hunt at the shelter for her kids. It tells you a time where she and Crystal, when they were homeless, you know, pooled their money and bought this young boy lunch, you know, who was looking for scraps at a McDonald's, you know. And it shows me how gracefully and powerfully people like Vanetta refuse to be reduced to their hardships. GJELTENMatthew Desmond, his book is "Evicted: Poverty and Profit in American City." I'm Tom Gjelten. You're listening to the Diane Rehm Show. And how did you find these people, Matt? How did you -- I mean, you said that you -- first you move into the rooming house or the trailer park, and then I think you said at one point that you hung out in the office of the trailer park, and you met people as they came in. GJELTENAnd one of the really interesting things about your book is that you seem to be as interested in the landlords and the people on that end as you were with the tenants themselves. DESMONDI think that's absolutely right, and we let ourselves off the hook if we just say, oh, these tenants, you know, they made mistakes, or these landlords, you know, they're just greedy. You know, the reality is it's a lot more complicated than that. GJELTENWell, you say poverty is a relationship, which is really interesting. DESMONDRight, right. You know, we have to think about how poverty isn't just a result of low incomes, jobs and joblessness, it's also a result of extractive markets. You know, some people make money off poor folks, some people make quite a lot of money off poor folks. But I think that, you know, if we're going to house the vast majority of our low-income families in the private market, landlords have to be at the table, and we have to understand their perspectives. GJELTENRolf Pendall, we talked before about this, the trends in this. What is the sort of the larger economic context that explains this great problem of access to housing? Why in this country is housing itself such a problem for so many families? PENDALLIt's a big problem right now because of two coinciding forces. One of them is the lingering effects of the Great Recession. The economy is coming back, but wages really haven't recovered for a lot of people, and not everybody's gone back to work who stopped working or gone to work who might have gone to work if it hadn't been for the recession. People who might've moved into homeownership are still renting. And so this is -- you know, the rental markets are clogged with those folks. PENDALLIn addition we had this big new generation, the millennials, who are starting to move out of their parents' basements, and so we have really pretty strong rental housing demand right now. And so that's caused rental vacancy rates to drop all over the United States. Rents are going up. In the last two years, the inflation rate for rent has been 10 times the inflation rate for everything else. And if people's paychecks are getting adjusted based on that general cost of inflation, they're not able to keep up with the rent. GJELTENNow food stamps are an important of the safety net, and basically everybody can get them. Why is it so different for housing? Why do food stamps go to everybody, but so few, I think Matt said one out of four families that need housing assistance get it? PENDALLThe country has never made a commitment to supporting all low-income people with enough money to pay their rent, not -- it's been discussed, but it's never been enough a priority to say it's a universal right that everyone should have to have a stable place to live. GJELTENAnd Matt, did you, after, after going through this experience and writing this terrific book, have you come to any conclusions about what has to happen? DESMONDAbsolutely, and I think that, you know, we're in Washington, D.C., right now. The waiting list for public housing in our national capital is not counted in years, it's counted in decades. DESMONDDecades. So if a young parent applied for public housing here in Washington, D.C., she or her literally might be a grandparent by the time the application comes up. This is causing an enormous amount of suffering and pain. It's a cold denial of basic rights. I mean, Vanetta, such an amazing mom, you know, she cared deeply about her kids, and we squander that talent, and we squander her ability to reach her full potential and allow her kids to reach their full potential because we're not offering her basic, affordable housing. GJELTENMatthew Desmond is the author of the book "Evicted: Poverty and Profit in American City," also a professor of sociology and co-director of the Justice and Poverty Project at Harvard University. And we're talking about his new book. We're going to take a short break right now, and when we got -- when we get back, we have a board here that's loaded with phone calls, and we're going to go to the calls. Stay with us. GJELTENWelcome back. I'm Tom Gjelten from NPR sitting in for Diane Rehm today. And we're talking about the housing crisis in America with Matthew Desmond, who's the author of a new book, "Evicted: Poverty and Profit in the American City." He's a professor of sociology at Harvard University. I'm also joined by Rolf Pendall from the Urban Institute, who focuses on housing issues there. GJELTENNow, Matt, before the break we were talking about your efforts to look at this from not only the tenants point of view, but also the landlord's point of view. And you spent a lot of time with landlords, as you told this story. Because you wanted to understand the relationship between the tenants and the landlords. DESMONDThat's absolutely right. I wanted to know why a landlord would evict you, but not me. I wanted to know why you'd buy (unintelligible) where you do. I wanted to know what makes him tick and just kind of what influences them, yeah. GJELTENAnd we are actually joined on the phone today, at this hour, by Tim Ballering, who's the founder and owner of Affordable Rental Associates LLC, in Milwaukee, Wis. And there he oversees the rent and management of apartments of low-income tenants. Tim, thanks for joining us. GJELTENAnd so tell us a little bit, if you can, from, you know, how do you see these issues developing? You are someone who is committed to providing affordable housing for low-income people. How difficult is that and do you have any sense, you know, sort of from a landlord's point of view, how these situations develop? BALLERINGYes. You know, I think there's a misperception that landlords somehow win or they enjoy or whatever the eviction process. And in reality everybody loses in the eviction. The typical eviction, by the time it's all done it has cost the landlord two to three month's rent. It's cost the -- court costs, the movers. So in every one of these evictions the landlord has also lost. And, you know, we do evictions, of course. You cannot run properties if you're collecting the rent. It's very expensive. BALLERINGPeople don't understand the amount of expense involved in running properties, especially in older properties in lower-income neighborhoods. And for the most part the tenants that we evict are not bad people. It's just bad situations that an owner cannot afford not to collect the rent. You have maintenance to pay for, you have taxes to pay for. GJELTENWell, what can you do as a landlord? I mean, you are committed to providing affordable rental associates. And what, you know, what has your approach been in order to do that? BALLERINGWell, we attempt to work out situations. We attempt to work with, you know, organizations that provide different services. In Wisconsin we have emergency assistance, which they help pay rent to avoid -- it's through the state. They help pay rent to avoid eviction. We work with some of the community groups to find what resources. But it doesn't always work out. It's a situation that I think that needs to change. I agree with Matt on many, many aspects of this, that a change has to occur. BALLERINGAnd landlords have to be part of that, not forced down upon them, but part of the overall solution. And both landlords helping with the solution, but also landlords being helped with the solution. A fair number of the smaller landlords that are undercapitalized have a hard time surviving evictions. If they lose three month's rent, now they're behind on their taxes, they're behind on their water, they're behind on their mortgages. GJELTENNow, one of the things that Matt talks about in his book, and that Rolf has also written about, is the use of -- possible use of housing vouchers. Is that something that you think might be a good idea? BALLERINGI think it's an excellent idea. And once Matt's done with his book tour, I want to talk him about how we can work together to try to achieve something in Milwaukee or legislatively, Madison, Wis. And maybe his next book could be "Housed: Where Everybody Has a Home." I think that there are answers out there, not enough. GJELTENYeah. Not enough resources are going into it. Well, Tim, really we appreciate you calling in with your perspective. You sound like a sympathetic landlord and one who is committed to doing whatever you can from your perspective to address this crisis. Thanks very much for joining us. GJELTENAnd that's Tim Ballering. He's the founder and owner of Affordable Rental Associates in Milwaukee, Wis., where he oversees the management of apartments for low-income tenants. We have a number of callers now with different experiences in this area that they want to share with us. Let's go first to David, who's on the line from Indianapolis, Ind. Hello, David. You're on "The Diane Rehm Show." DAVIDHey, good afternoon, gentlemen. This is an outstanding show. Thank you very much. And I just -- I wanted to say I'm a salesman. I work in the field. And initially I started out doing this in our outlying area, some of our suburbs of Indianapolis. But now I work for a company that works in the city of Indianapolis. And this has become so obviously apparent to us. I mean, daily I see people's belongings left at the curb. DAVIDThere is a business started where people have their truck and go around looking for these evictions and pick through folks' stuff and take it and sell it and do whatever. They literally have started a business. I've seen three different men in trucks regularly doing this. That has become so evidently bad. GJELTENAnd, David, you say you see -- doing your door-to-door sales, you see evictions happening -- did you say every day? DAVIDPretty much daily I see something where I run into -- I -- okay. Just recently I ran into one where they were literally throwing these folks out -- their things out the second story window because they didn't feel like carrying them down. Breaking everything, tearing up everything, then pushing it out to the curb, end of story. I don't see an actual eviction every day. I see the result s of an actual eviction every day. GJELTENRight. And, Matt, David mentioned that there are people that make money off evictions. He talks about people going around and picking thorough people's possessions and reselling them. You talk in your book about moving companies that specialize in the eviction business. DESMONDThat's right. And, you know, there's a lot of folks that have kind of sprung up and come around the fact that we're evicting families not by the tens or even the hundreds of thousands, but likely in the millions every day in America. It's not just in Milwaukee. It's not just in San Francisco and New York. You know, it's in Indianapolis and Cincinnati and Cleveland, Ohio. And so this is a book that's set in Milwaukee, but this tells a deeper American story. GJELTENRolf, you're nodding your head. PENDALLYeah, and I think I'd also say that the visible part of eviction is only really the tip of the iceberg when it comes to instability and housing situations. And I think this is actually something that Matt is working on right now, really trying to get a handle on, you know, the -- what's down below the surface, in terms of the way that the housing crisis disrupts people's lives. So, Matt, do you have any -- I'd love to hear sort of your thinking about sort of what else is out there that you're looking for. DESMONDYou mean in the data? Right now we're trying to get eviction records from every single county in the United States to understand if certain cities have different levels of eviction, what kind of laws are working and the neighborhood consequences of eviction. So this is something that we're trying to get after. You're absolutely right that those evictions, however violent, are the tip of the iceberg. And there's a lot more forced moves that go on, other than just the ones that you see where the effects are lining the curb. PENDALLThose are the folks who may have a family member they can rely on for a little while. They move in with a family member for a couple weeks. Things get a little bit dicey at home. They have to move and they -- so they go from place to place. I'm sort of wondering about those aspects of the housing crisis that, you know, that are also, you know, part of this. And, you know, they may not end up evicted, but they certainly end up destabilized and they have some effects, yes. GJELTENOh, they create family situations, problematic family situations it sounds like. DESMONDIt's tough, you know. And a lot of the folks that I spent time with, they sometimes relied on their family, but often they couldn't. You know, their family just wasn't there. They didn't have enough resources. And so they relied on strangers and acquaintances. People they met at the homeless shelter or bus stop to make ends meet. And the way that people are addressing these conditions of extreme poverty is both with ingenuity and courage, but also in a way that has really deep consequences for their lives and their children's lives. GJELTENLet's go now to Nick, who's on the line from Bainbridge, Pa. Hello, Nick, thanks for calling "The Diane Rehm Show." GJELTENAnd your comment or question? NICKSo I was a landlord, not by choice. I had bought a house when I was 20 years old before the market crashed. And by the time I was ready to move I owed way more than it was worth. So I decided to rent it out. And my very last tenant, I decided to go through Section 8. GJELTENAnd what does that mean? What does that mean, Nick? NICKOh, Section 8 is the affordable housing in Lancaster City. And it's a government subsidy housing. And to get it the landlord has to go to the county office and say I'm willing to accept Section 8 tenants. Then they have to come and approve your house. You have to meet all these criteria. GJELTENAnd then you get some assistance from the government, I guess, in covering your costs, huh? NICKWell, yeah, the government then pays these people's rent. GJELTENAnd how did that work out? GJELTENDid that work out for you then? NICKIt worked out horribly. It was absolutely horrible. My tenant ended up asking if she could break her lease early because she wanted -- she got approved for Section 8 in a neighboring school district, which was a better school district. And being a father, I was like, yeah, of course, you can break your lease early, you know. I'm all about, you know, your kids being in a better school district. So I did her this favor, wrote her a note saying that, you know, I hereby allow you to break your lease, you know, upon, you know, these few things being repaired. NICKShe had started some home improvement jobs that she wanted to put a new kitchen floor in and a new sink, which I allowed her to do on her own dime because, you know, she was living there and I wanted her to have things that she wanted. Well, the day came that she was supposed to move out and she didn't move out. Well, Section 8 stopped paying me 'cause they were already paying her new landlord at the time. So the end of the month comes around, she won't let me in the house. I need to check on the repairs. She won't let me in the house. NICKSo I have to go through the eviction process at this point. And even though she had broke her lease, even though the state was paying her rent, there was nothing I could do to get her out of my house. I had to take her to court three times in 30-day increments, the whole time I'm not making any rent on a house that I'm still paying the full mortgage for, all the insurance, all the utilities. And she ended up owing me like $8,000 when it was all said and done with the damages she did to my house that she never repaired. GJELTENAll right. Okay, Nick. That is a story from the landlord's perspective. I'm Tom Gjelten. You're listening to "The Diane Rehm Show." And, you know, what -- Matt, what Nick's story reveals, I think, is that the whole system is broken, as it were. I mean, from whether you're a landlord or a tenant, there are a lot of problems in the way that governments are handling this issue. DESMONDWe could do a lot better out there. I think the big picture, though, is, you know, most folks are just crushed by the high cost of housing. And that's putting them in incredibly desperate situations. You know, for Nick's story, I could match Nick's story with a horror story about a landlord, you know. And there are tenants out there that abuse landlords and there are landlords out there that abuse tenants. But the bigger picture is do we in this country believe that housing is a basic right for everyone that lives here? DESMONDDo we believe that stable, affordable housing is something that -- what it means to be an American? And I think we have to answer yes, because without stable shelter everything else falls apart. We know that when people finally get a housing voucher, after years and years on the waiting list, the number one thing that they do with it is they go to the grocery store and they buy more food. And their kids become stronger and healthier. But a lot of kids out there, like Vanetta's kids and Arlene's kids weren't getting enough to eat because the rent eats first. We don't have to accept that situation. GJELTENWell, as you say, I mean, we seem to have understood that everybody needs food, which is why we have food stamps. But we haven't reached that point yet on housing. DESMONDRight. But we've affirmed, you know, basic education, access to decent nutrition, provision in old age because we know those things are fundamental to human flourishing and economic mobility. And it's impossible to argue that housing isn't fundamental to those things as well. GJELTENWe have an email from Bonnie, who writes -- this is something we haven't actually gotten into too much, and that's about the sort of the legal procedures that follow eviction. "There is no legal requirement," she writes, "that people facing eviction have free access to a lawyer. This is due to the fact that civil representation is not required. GJELTEN"In the area that I live, the legal service center reports that there are over 3,000 cases that go unserved each year due to this problem." And you actually have some very moving sections in your book, Matt, where you were in a housing court. And you're right about the lack of representation that tenants facing eviction have. DESMONDThat's right. Unlike in criminal court, low-income families that are facing eviction or foreclosure have not right to a lawyer at all. So in some housing courts around the country, 90 percent of landlords have attorneys and 90 percent of tenants do not. Now, if you're someone like Arlene, that has, you know, an 11th grade education and you have to go and face your landlord's attorney, you might not even show up. And a lot of tenants don't. About 70 percent of tenants who are summoned to eviction court in Milwaukee just don't show up and receive a default eviction judgment. DESMONDI think extending legal aid to indigent tenants in housing court would curb illegal evictions, would make sure families don't sign bad stipulations, which are the civil courts' plea bargain. And would allow cases to be heard, unlike the majority of them. Families could go to work or they could stay with their kids while their attorney serves their case. It's a smart use of public funds to stem the fallout from eviction upstream so we don't end up paying for it, financially and morally downstream. GJELTENAs I say, you have a very pointed description of what those housing courts are like when you see the lawyers on one side and the tenants on the other side, most of whom are black women, I think you said. GJELTENIn the case in Milwaukee. DESMONDYeah, I mean the face of America's eviction epidemic belongs to mothers and kids. Anyone that's been to housing court can see kids running everywhere. And this has a disproportionate effect on low-income African-American communities. But it's not just in those communities. You know, it is affecting immigrant communities, low-income white communities, one in five of all renters in the United States report paying at least 50 percent of their income to housing. GJELTENAnd one of the great lines in your book is that black men get locked up, black women get locked out. DESMONDBlack women are disproportionately facing the fallout of eviction, yeah, absolutely. GJELTENMatt Desmond is the author of a terrific new book, "Evicted: Poverty and Profit in the American City." We're also joined by Rolf Pendall, from the Urban Institute. And earlier, we actually heard from one of the people in Matt's book, Vanetta, not her real name. She lives in Milwaukee. And she shared with us her experience with evictions and how she has managed to turn her life around. GJELTENWe were also joined on the phone a bit earlier by Tim Ballering who is a landlord, the founder and owner of Affordable Rental Associates in Milwaukee, talking about the difficulties from a landlord's point of view. It's been a terrific hour. Thanks for coming in. Thanks to our listeners. I'm Tom Gjelten. This is "The Diane Rehm Show."